Confession time – I’m enamored with the “gentle giant” character in romances. It doesn’t matter if it’s a M/F romance or a M/M romance, the big guy usually draws me in. I suspect it’s due, in part, to the fact that I’m almost 5’8” and tend to wear shoes with a 1.5 to 2-inch heel, so I like the idea of a man who can tower over me and make me feel dainty when I am far from it. Because of this, I jumped at the chance to review Big Love. I should note that this is the first of Reed’s works that I’ve ever “read” and it won’t be the last. Not only was I treated to a beautiful tale of romance and self-discovery as Dane comes to terms with his sexuality after his wife’s death, I was treated to two such stories as one of Dane’s students, Truman Reid, learns to embrace his sexuality and “sissy”-hood (sissy is Truman’s word) as he is forced to navigate the shark-infested waters of high school. The first day of school is one neither Dane nor Truman will ever forget. On the same day that Dane intervenes to stop what would be the first of many, many incidents of bullying that Truman is subjected to, Dane experiences the biggest loss of his life – the death of his wife. Even though that day marks the beginning of each man’s journey to self-acceptance, it is a path that is vastly different for each of them. Neither Dane nor Truman’s life will ever be the same, but for very different reasons – Dane has to admit a secret to himself that he’s ignored for decades. At the same time, Truman has to learn one of the most important lessons ever – you cannot control how others feel about you, you can only control how you let their actions and words affect you. In other words, never let them see you sweat. Because Big Love focuses on Dane coming to terms with his sexuality and his subsequent romance with Seth, we only see parts of Truman’s journey, giving the reader light, yet filling servings of angst, acceptance, heartbreak, courage, and fierceness. Which, for me, was great because it helped temper my desire to throttle Dane’s daughter. Thankfully, Dane is a much better parent than I, so he was able to guide his daughter through her grief and anger regarding her mother’s death, and the eventual understanding and acceptance of her father’s sexuality. As you can see, it’s a good thing Dane was a gentle giant because he needed mighty big hands for all he was juggling. Fortunately for both Truman and Dane, Seth proved to be vital to their success in discovering and embracing who they were as individuals. In his efforts to help Truman, Seth also helped Dane and it was beautiful watching all three men – because Seth had his own issues to face – grow over the course of the novel. As for the narration, I found Michael Pauley’s voice to be pleasant for the most part. There were times when it bordered on grating, but because it occurred primarily with only one or two characters, I believe that was intentional. There were a few times I wasn’t able to tell when a character was speaking versus thinking, however, it did not detract from my ultimate enjoyment of the book and I hope to have the opportunity to listen to more of Pauley’s narration. I will note that the downside of audiobooks is that sometimes the end arrives unexpectedly and this was true for Big Love, I just wasn’t ready for the story to end and Reed certainly left me wanting more. 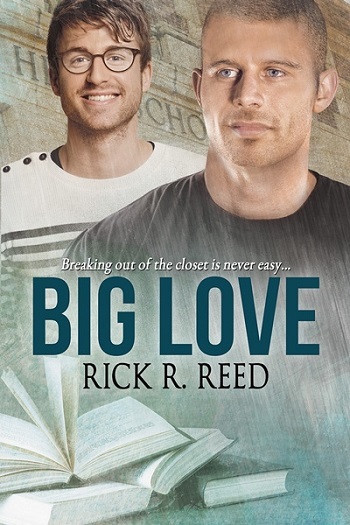 Reviewers on the Wicked Reads Review Team were provided a free copy of Big Love by Rick R. Reed, Narrated by Michael Pauley to read and review.